This article is from the Spring 2001 AFRMA Rat & Mouse Tales news-magazine. QI own two mice, Muffin and Freckles, and would like some information on mice. What is the best food for them? Is there a better brand of cedar shavings or are they all the same? Is there a cage you would recommend? Can they learn any tricks? Is it all right for them to have extra treats? This mouse is checking out the lab blocks. Muffin and Freckles live in a Hartz Play City cage and eat Hartz treat. Muffin’s favorite treats are dog bones and peanuts (in the shell). Freckle’s favorite treat is peanut butter, but she likes raisins too. 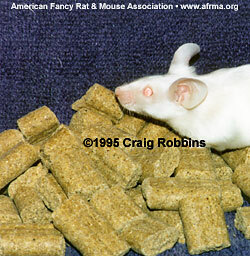 AThe best food for mice is a good brand of lab block (also sold as rodent chow or rodent diet). This is a pellet that has everything in it your mice need to eat. Hartz Treat is okay to give once in a while as a treat, but shouldn’t be the only thing you feed your pets. Mice also enjoy treats of whole wheat bread, pasta, fruits, and vegetables. Stay away from nuts and high-fat seeds since they can cause your mouse to get fat and have health problems. This mouse is on CareFRESH™ bedding. 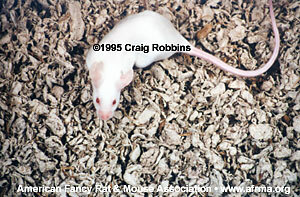 Unfortunately, all types of cedar shavings (and pine shavings) are bad for your mice. The oil in them (the stuff that makes them smell good) causes the mice to get sick and so does their strong smell. The best beddings are aspen or CareFRESH™. The best cage for mice is an aquarium with a lid made out of screen or wire mesh. The Hartz Play City also works very nicely, though they can be hard to clean.